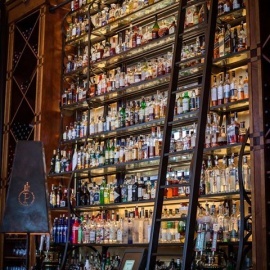 At Pierponts, a 20-foot Library Ladder Bar brings a whole new meaning to top shelf! Pierpont's at Union Station has been called "the culinary jewel" of Kansas City with food and service as memorable as the historic setting. A sister restaurant to Kansas City's legendary Hereford House, Pierpont's continues the tradition of serving top quality perfectly aged steaks along with fresh seafood arriving daily. Posh classic with high ceilings & a mahogany bar pairs prime steaks & seafood with a vast wine list.